Welcome to the home page of the RTSIM project. RTSIM stands for (Real-Time system SIMulator). It is a collection of programming libraries written in C++ for simulating real-time control systems. RTSim has been developed at Retis Lab of the Scuola Superiore Sant'Anna as an internal project. It has been used primarily for experimenting with new scheduling algorithms and solutions. For this reasons, it contains, already implemented, most of the scheduling algorithms developed at Retis Lab. We now decided to release this software as open source, to let other researcher in the world to play with the simulator. The dream is to have a common simulation platform for comparing the performance of new scheduling algorithms. RTSim is currently compatible with many systems, including several distros of Linux, recent FreeBSD, Mac OS X and Cygwin. In addition, the software has been tested with all major releases of GCC, from 2.96 to 4.0.1. Under Windows, the software can also be built using MinGW32. Instructions for compiling and installing the software are in the README file included in the distribution. However, many recent versions of octave have been successfully tested with RTSim. Please read the README file for specific per-version instructions, and possibly to set up for octave usage (you may need to correct some errors in the octave headers depending on which version of octave and GCC you have). metasim: it is a it is a generic library for simulation of discrete event systems. This library is also released separately, see the metasim home page. 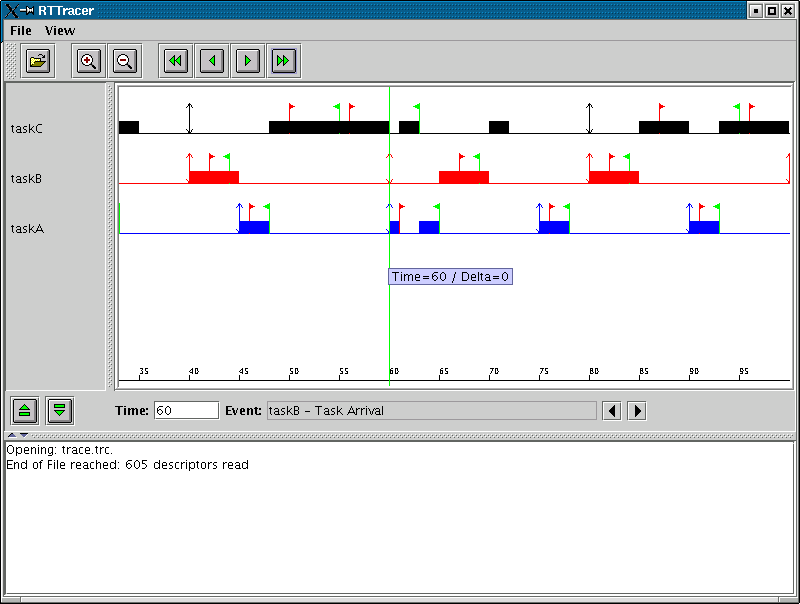 rtlib: based on metasim, it is library for simulating scheduling algorithms and real-time tasks. ctrlib (optional): it is a library for simulating real-time control systems. It requires the octave library. 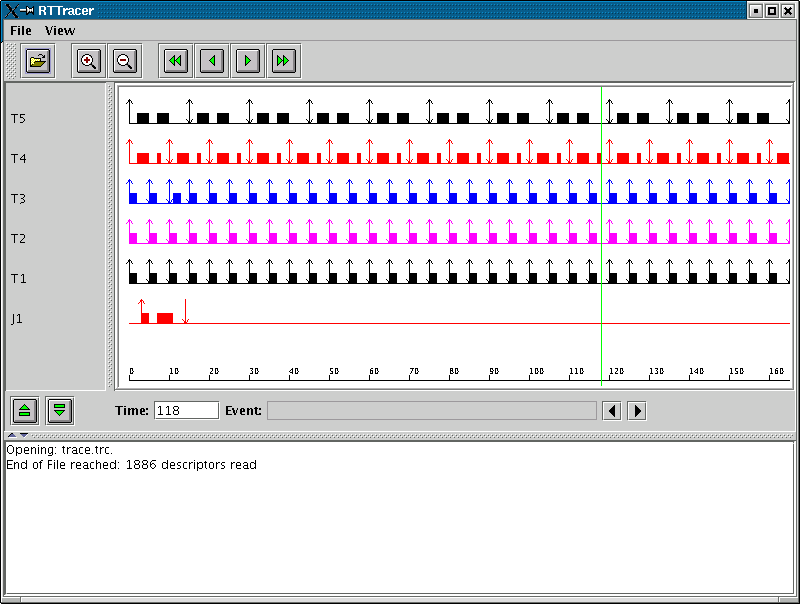 jtracer (optional): it is a java based tool for visualisation of schedule traces produced by a rtlib program. In the first screenshot you can see a jtracer window showing a schedule of 5 periodic tasks (T1, ..., T5) plus one aperiodic job (J1) on 3 processors, scheduled by EDF. This example is part of the RTSIM distribution: you can find the source code in rtsim/rtlib/examples/medf. On each line you can see the time diagram of each task, and each task is shown in a different color. In this second screenshot, you can see three tasks scheduled on one processor with fixed priority plus the priority inheritance protocol. Each red flag represents a wait operation on a semaphore, and each green flag represents a signal operation. In the figure, task A is the highest priority task, task B is the medium priority, and task C has the lowest priority. Notice what happens at time 60: task A, which is the highest priority task, tries to lock the resource, but it is blocked by task C. Thanks to the priority inheritance mechanism, task C can now execute with the priority of task A, thus executing before tasks B. As you can see, the priority inversion problem is avoided. This example is part of the RTSIM distribution: you can find the source code in rtsim/rtlib/examples/piresman. If you want to join the development of RTSIM, please contact the project administrator at this address. Note that you will need a SourceForge account.